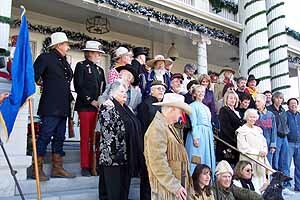 It was produced, we are informed, to celebrate the 150th anniversary of Nevada statehood, and to raise money for the Comstock Foundation for History and Culture, a non-profit organization dedicated to “the restoration and promotion” of the Virginia City National Historic Landmark. The Foundation is funded by Comstock Mining Inc., the company actively destroying the Virginia City National Historic Landmark. Two CMI corporate officers sit on the Foundation’s Board, which engaged Steven Saylor of Dayton to create “Nine Cheers for the Silver State” (above), a tableau painting announced as a tribute to the moment of statehood for Nevada. A platoon of prominent public servants past and present were recruited to be painted into an imaginary scene of celebration. Saylor had produced posters like this before. 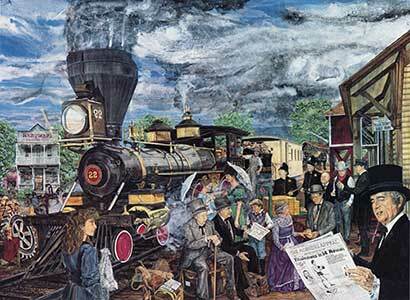 His most memorable effort in this line was titled “Heavyweights” and depicted some of the same well-known political figures — this time the setting was a railroad depot — as a fund-raiser for the V&T. So when ex-governors and senators and other high-profile individuals were asked to reprise their roles to help raise money for the Foundation, they pitched in wholeheartedly. They didn’t simply sit for some photos, each one of them signed 150 of them to increase their value and actively promoted the project. Many of Steven’s Comstock neighbors have rallied to help on previous occasions. Steven’s neighbors here on the Comstock recognize this willingness to participate in a good cause. We have answered his calls for volunteers ourselves. 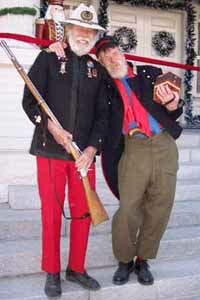 At his request, the Silver City Guard mustered at the Governor’s Mansion for a photo shoot, and served as models for one of his projects. We didn’t inquire very deeply into what was what and who was who; he asked for our help and we gave it, along with many others. We trusted him. This time around he did not call on us to help out, and he didn’t tell us that he was turning his back on us by joining the effort to bring heavy industry into our communities. That came as a disappointing surprise, but what really fried our eggs was that he inserted John V. Winfield and Corrado De Gasperis, Board Chairman and CEO respectively of Comstock Mining Inc., into the picture. This changed its meaning and its message entirely. The Comstock Foundation for Culture and History provides cover for CMI’s destruction of the Virginia City National Historic Landmark and the communities it contains. Imagine portraying former Governor and former Senator Richard Bryan, a board member of Preserve Nevada (preservenevada.org), offering a champagne toast to the laughing Chairman of the Board of the company that’s destroying the National Landmark! Imagine seeing Senator Dean Heller having his wine glass refilled by Ron James, who failed to make protecting the Landmark his business when he was the State Historic Preservation officer and has now joined in its destruction. And wasn’t Dean Heller a teetotaler once upon a time? At the center of the picture imagine the mining company CEO Corrado De Gasperis, dictating to Governor Sandoval, who eagerly writes down every word. 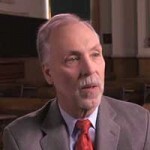 Ron James, Nevada’s former state historic preservation officer, is now executive director of the CMI-funded Foundation for History and Culture. James “scoffed at the criticism” by residents of the Comstock according to the Reno News & Review article linked above, saying he was “not impressed by the naysayers who aren’t doing anything at all that’s positive”. In 2007, this same Ron James presented the town of Silver City and local archaeologist Dr. Ron Reno a Nevada Historic Preservation Award. The award honored the entire town of Silver City, and the lead archaeologist for the project, Ron Reno, a resident of the historic town, for their dedicated retrieval of thousands of artifacts associated with the remains of the historic 1860’s schoolhouse which had been used as a community center for many decades. James said Ron Reno won the same award eight years before for his work with the Comstock Historic District, which usually disqualifies someone from being considered a second time, but this was such an important achievement that he was again honored for his contributions. Silver City is heavily populated with nay-sayers who commiserate with Ron over his unfortunate memory lapse. Mr. De Gasperis says he was uncomfortable about appearing as a central figure in the image. “It was really awkward,” he said demurely. He was only persuaded by the prospect of a $100,000 haul for the Foundation, and so he reluctantly gave in. For all his expressed reservations, De Gasperis is wearing the smile of the cat that ate the canary. And who could blame him? And what could have persuaded John V. Winfield to include himself in this stellar group, you might wonder, other than narcissism and self-aggrandizement? Now they can show the world that they have friends in high places, that they rank with men and women who have devoted years of service to Nevada. It’s not true of course, but that’s what the image shows and that’s why it has been retitled “Nine Cheers for Backroom Deals” here on the Comstock. The District Court in Lyon County and the state Ethics Commission are considering complaints about backroom deals in Lyon County right now, and we’re sensitive on the topic. It’s hard to imagine anyone displaying this tasteless piece of propaganda, much less paying through the nose for the privilege — except as a collectible piece of Nevada flapdoodle perhaps, rather like a stock certificate but more expensive. CMI is an under-financed junior mining company that has burned through $200 million of stockholders’ money without even an inkling of profit, despite four and a half years of golden promises. The painting doesn’t portray this. That’s what’s wrong with this picture. 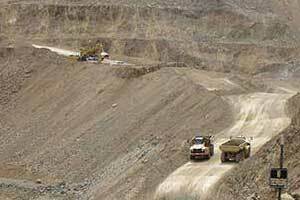 In other Comstock mining news, CMI has announced its third quarter loss. The company has already announced a $14 million stock sale to a bargain-hunting investment firm. Listed price at the time was bumping up as high as $1.20 from a low of $1.01. You call this art? Flapdoodle for sure. All that can be said of this whole fiasco (Hopefully) is UNETHICAL.